Welcome to Astral Spa, Azamara Journey's spa and fitness center. Following lunch we took a tour of the spa, signed up for the cruise pass for the Thermal Spring and private spa deck. The Thermal Spring features a private spa deck with Thalassotherapy Bath. Minerals in the warm water, combined with powerful jets massage your body will you bask in the sun. One of the best bargains for a couple on the Journey is to sign up for the full cruise use of the spa deck which includes the Thalassotherapy Bath. The price (at time of this post) is $20 per person for a one day pass or $99 a person for the whole cruise. A couple can purchase the same pass for $175 which is a substantial savings over single use or individual pricing. We signed up for the entire cruise but due to rough seas, all pools were closed the first sea day. We'll just have to go multiple times some other day to make sure we get the full benefit of the package. As is the case ships, this spa is run by Elemis and is a full service facility. We are looking forward to hot stones massages on Friday. Another bargain is to schedule your massage or other service on a port day, which is why we picked Friday. We'll be in St. Martin for the entire day, leaving at 11 PM at night which gave us plenty of time to see the port while also taking advantage of special pricing. After disembarking Royal Caribbean's Allure of the Seas pre-inaugural, we transferred from Fort Lauderdale to Miami where we spent the night at the Marriott Biscayne Bay. From our bay view balcony, we watched the sunrise as the ships pulled into port. Hidden behind the Celebrity Cruises building is Azamara Journey, which will be our home for a West Indies cruise. For those that haven't heard of Azamara Club Cruises before, we'll be telling you all about the company, the cruise experience, and the ports of call we visit over the next 12 days. Azamara Club Cruises reinvented itself in April of this year, adding new amenities and destinations. It is part of the Royal Caribbean Ltd. family of cruise lines but it does operate as an independent business unit. Azamara Club Cruises is a luxury cruise line which strives to bring you a different experience than on the larger ships in her sister cruise lines. You'll be immersed in the destinations you visit with more time spent in the destinations than on most cruise lines. The ship has just come across from sailing in Europe this summer so this is the first opportunity for us to experience the ship after the program changes. Be sure to check back here and on our Facebook fan page for pictures and more details. Most cruises we start out with lunch in the buffet, but on Allure of the Seas, we decided to try a couple of the venues in Central Park and Boardwalk. If you have been reading coverage of the Allure of the Seas pre-inaugural cruises, you may have read a review that said the Dog House was a miss. We come from Hot Dog country, Chicagoland, so our curiosity got the best of us, and we decided to make our first lunch stop on the Boardwalk. Select the "hot dog" of your choice from the menu and add one or more toppings to complete your meal. The choices include mixed peppers, fried onions, sauerkraut, and sweet relish. The Big Apple which is chicken and bits of apples on a sesame seed baguette. The Sicilian which is pork, garlic, oregano and Italian spices on an oregano and paprika baguette. We topped one with sauerkraut and the other with peppers and onions. Having cruised for years, we are well aware that everyone has their own likes and dislikes when it comes to food served on the ships. We took an informal poll among others that were seated around us. Everyone had the same opinion as we did, that the meal was enjoyable and that they didn't understand why it had been labeled a "miss". Regardless of what others say, our suggestion is that when you are on the Allure of the Seas, you find out for yourself. Following the mandatory safety assembly, it was time to get ready to sail. To start the party in a unique fashion, we decided to join the party in the Aqua Theater. There was another party underway on the Royal Promenade. The cruise entertainment staff, along with the DreamWorks cast of characters, got the party started with a flag parade and then one by one the DreamWorks characters joined them on stage. Under the stage where the performers are standing is the pool that is used for the aerial water shows and dancing waters. The first Madagascar character to join the party was King Julien XIII, a ring-tailed lemur who has light gray and white fur, big yellow eyes, tiny whiskers, a black nose, thin black eyebrows, fox-like ears, a long black-and-white striped raccoon-like tail and wears a crown. Since he loves to dance, sing, and party, he was the perfect one to get the celebration going. Alex the Lion, the alpha lion of his heard, showed more interest in dancing than in hunting, much to the disappointment of his father who tried to teach him to hunt. No hunting was going on poolside, but there was lots of dancing as Alex joined the cast on stage. By now the audience was getting into the party spirit. One by one the cast of Madagascar and other DreamWorks movies joined in the celebration on stage, each appearance bringing roars from the audience. Some folks from the audience were chosen to come onstage and join in the dance. It probably isn't a surprise to most that Shrek and Fiona were the grand finale to the sail away party. They are shown here waving good-bye as the party comes to an end. We have plenty more pictures and details to share with you about the party. To see the rest of the pictures, become a fan of our Facebook Fan Page. It's not everyday that you go on a cruise and party with the DreamWorks characters. Royal Caribbean has entered into a partnership with them so this is only the first of many times you'll be able to see them on board Allure of the Seas. In fact, rumor has it that they have moved in. We watched as Allure of the Seas crossed the Atlantic in anticipation knowing that it would soon be our chance to explore the largest ship afloat ourselves and bring you our insider look at this new ship. Today, we wait no longer. This is the first of many update on Allure of the Seas that we'll write both here and on our Facebook Fan Page. You'll want to sign up for our fan page so that you won't miss any updates. We arrived at the Port Everglades pier around 11:00 AM. Royal Caribbean built a new port facility specifically for the Allure of the Seas. They claim that from the time you enter the front door, it will only take 15 minutes to get checked in. They did hold true to their promise. In order to make that possible, the embarkation area is divided by deck numbers. If you have a suite you get escorted to a separate are where you even will have a private seating area. You'll be the first to get on the ship once it is available for boarding. The first thing you do after entering is to go thru security screening of your luggage just like you would at an airport. After the security check, you are directed to the checkin personnel for your deck. All you need is your Sea Pass, Passports, and credit card for onboard charges. You'll fill out the health questionnaire while the agent processes your paperwork. By the time you finish signing your name, the agent will be waiting to snap your first photo - this one is for your Sail 'n Sign card. This will be the only card you need for the rest of your cruise. It will get you in your cabin and unlock all the extra goodies that you can purchase onboard the Allure of the Seas. At 11:30 AM the ship was cleared for boarding so we made our way up the winding ramps to the gangway entrance. Along the way we had our photo taken and showed our key card a few times before the formal embarkation was over. Many of the cabins were not available but we lucked out and our cabin steward told us we could drop off our luggage. We were on our way to explore the ship and sample some of the dining options. One of the unique features on Allure of the Seas are the many different types of cabin categories. Last count I believe there were 37 different types. Even among the types, some locations are better than others, depending on your requirements, so I strongly encourage you to seek professional assistance to select the right cabin. As mentioned, we had a room with a view. The cabin we had was 12719, which is one of the AFT Boardwalk Balconies. We had a perfect seat for the water shows right from our balcony. The aft cabin also has a great view for sail aways. Looking towards the forward part of the ship from our balcony you can see the various dining and entertainment options of Boardwalk. Finally, you can watch all the action of the Zip Line and Rock Climbing Wall. Check my Facebook Fan Page for some photos of me zip lining over Boardwalk. What a ride !!!! Welcome aboard ... there's lots to tell, so this is going to take quite some time to share everything with you. We had an action packed day onboard the Allure of the Seas. BTW, I'm writing this from my balcony - so far the onboard internet has been very good, but we all know speed depends on where the ship is relative to the satellite. It's hard to believe that Thanksgiving is here already. Where did 2010 go? As has become my tradition, I'd like to share with you some of the things that I'm thankful for and highlight some of my adventures this year. While this has been another tough economic year, it appears that the cruise industry has weathered the storm once again. Just this month, we have been highlighting the introduction of Allure of the Seas. Just a year ago, her sister ship was added to Royal Caribbean International's fleet. The two ships are the largest ships afloat. The photos above are from some of our cruises this year. Cruises Inc. and Cruise One held their National Conference on the brand new Norwegian Epic and we were fortunate to be able to attend. Just like the Oasis of the Seas and Allure of the Seas, several new innovations were introduced on the Epic. Although it isn't quite as large as the RCI ships, it is no small ship. The entertainment and food on the Epic take center stage along with the studio suites, which allow solo travelers their own haven at a price point to match. The Epic has much to offer cruisers. Norwegian Epic alternates between Eastern and Western Caribbean itineraries. Our conference was on the latter itinerary which included stops in Costa Maya, Roatan, and Cozumel. The picture of me in front of the Epic was in Roatan where we hired a local cab driver to take us around the island after we did a bit of shopping near the pier. In June this year we attended Cruise3Sixty, CLIA's annual conference. This year it was held in Vancouver, Canada. We extended our stay following the formal conference which allowed for touring of some of the local attractions, which despite many trips there in the past, we had not had time for. I'm pictured here hiking through Treetops at the Capilano Suspension Bridge. The highlight of the year is yet to come. We will be sailing on Allure of the Seas for one of the pre-inaugural sailings. The final cruise of the year will be on Azamara Club Cruises Journey. We will tour the West Indies on that cruise. Thank you for making our blog column a part of your lives in 2010. I hope that the information we share helps you to dream about future cruises of your own. I'd be honored to help you plan those trips. I have the best job in the world - helping make dreams come true. For that, I'm truly thankful. on Friday, April 29, 2011 at Westminster Abbey. London because it has a sense of intimacy. as a semi-state occasion. It's also the feast day of St.
though that is a coincidence. "The wedding of Kate and William will be a happy and momentous occasion," said Prime Minister David Cameron on Tuesday. "We want to mark the day as one of national celebration, a public holiday will ensure the most people possible will have a chance to celebrate on the day." Guests on board Cunard's three ships - Queen Mary 2, Queen Victoria and Queen Elizabeth - on 29 April 2011, the day of the Royal Wedding, need have no fear of missing one second of the historic union of the future King and Kate Middleton. Each of the three ships feature Royal Court Theatres - West End in style and West End in size - where the wedding ceremony will be broadcast live. Additional venues will be used, such as Queen Mary's Planetarium and lecture room, Illuminations, which seats a further 450 passengers, should demand exceed seating capacity in the theatres. The day will also be one of celebration on all ships, with that evening's dinner featuring a commemorative menu and a champagne toast. "Cunard is a company with an enviable heritage and unparalleled links to the Royal family - our ships were named either by Her Majesty The Queen or by her apparent successor, HRH The Duchess of Cornwall," said Peter Shanks, president of Cunard. "It follows then that our passengers are likely to have an above average interest in the pageantry of a Royal wedding. We intend to cater for that and ensure they do not miss one minute. "Royal weddings don't happen that often and with our impeccable Royal connections we intend to ensure that our red ensign ships lead the British merchant marine in marking this momentous day." 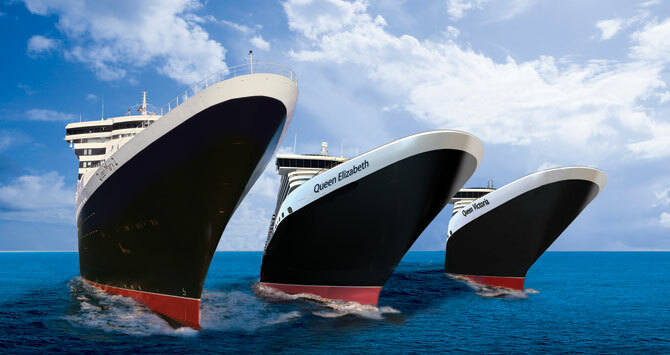 At the time Queen Elizabeth will be at sea heading for Southampton, Queen Victoria will be at sea in the Mediterranean, and Queen Mary 2 will be on a seven-night Transatlantic Crossing. Congratulations to the Royal couple and to Cunard Lines for quickly responding to the announcement and assuring that their guests have an opportunity to participate in this festive occasion. We've taken many pictures of cruise ships over the years and perhaps none was as striking as this image we captured in Cozumel, Mexico, during our recent National Conference aboard Norwegian Epic. Shown here are two Royal Caribbean ships: Grandeur of the Seas and Oasis of the Seas. 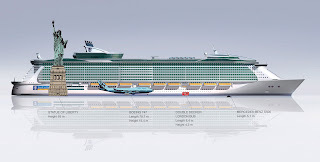 Royal Caribbean International® has announced new enhancements to their fleet for 2011. They call it the Royal AdvantageSM- the drive to provide the best, most innovative ships, features, destinations and personalized service to guests. In 2011, the Royal Advantage will be more apparent than ever. That's when Royal Caribbean will begin enhancements to expand their most popular innovations to select ships, giving more to see, more to do, and more to love, to more guests than ever before. More memorable moments are in store when DreamWorks® Experience and 3D movies come onboard. Sails 7-night Western and Eastern Caribbean itineraries from Fort Lauderdale, Florida. Even more imagination comes onboard with the DreamWorks® Experience, Broadway hit Saturday Night Fever: The Musical, and other amazing features. Sails 4 to 7-night Caribbean itineraries, and the Western Mediterranean. The matriarch of the Freedom class will be enhanced with the BRITTO Gallery, ImagineOcean! Puppet Show, a nursery and more. Sails 7-night itineraries from Port Canaveral, Florida, to vibrant Caribbean destinations. Parents will love the addition of the Royal Babies and Tots Nursery, and everyone will enjoy more dining options. Sails from Seward to other adventurous Alaskan cities, including Juneau and Skagway. Balcony staterooms and refreshed public areas are in store, along with more dining options, lounges and the Royal Babies and Tots Nursery. Sails South America's most amazing and diverse ports. Our Facebook Fans can learn more about these new enhancements in the near future. Be sure to Like Us so that you will be in the know. 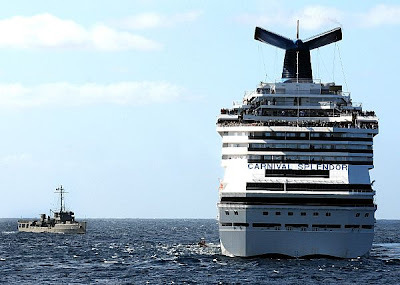 After Carnival Splendor arrived back in San Diego and the passengers headed for home, the long process of determining what happened and returning the ship to service began. 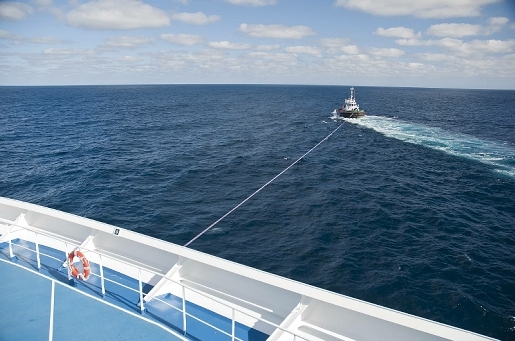 A joint task force made up of Carnival technicians, NTSB, Panama Government representatives, USGC and others descended on the vessel and started the process. After an initial assessment, it was decided that cruises needed to be cancelled until January 16. This left passengers and their agents, including yours truly, scrambling to reschedule stranded passengers who had planned holiday sailings on the Splendor. You might recall that during the incident, Captain Cupisti had to order the release of CO2 in the engine room to distinguish the cables. The fire crews had also used water to cool down the engine room. Thus, the engine room must be cleaned up from the CO2 and water before the actual damage can be repaired. As you might expect, this is a huge job. We will bring you updates as we learn more about the cleanup and repairs. Allure's executive chef takes you behind the scenes to show you how much food is needed each week and how the staff prepares it. Cruise vacations are well known for fabulous food and beverages served 'round the clock. While some people may gain weight during their cruise, that doesn't have to be the case as we'll learn in this video clip. One thing for certain, Allure of the Seas does have some "alluring" food for you to chose from. Kathie Lee and Hoda Kotb were able to sample selections from the various venues including Samba Grill and Cupcake Cupboard. Watch this video to get an idea about the mouth watering foods available on the Allure of the Seas. 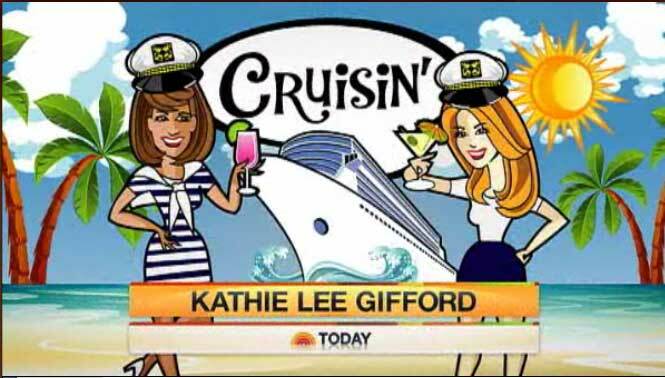 Kathie Lee and Hoda sampled some of the signature libations that can be found on the Allure of the Seas. Whether you are poolside or at one of the specialty dining venues, there is a colorful and tasty drink awaiting for you. Just ask one of the friendly bartenders to pour one of their specialties and enjoy. 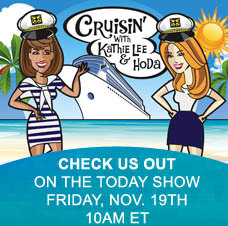 We continue our coverage of Kathie Lee Gifford and Hoda Kotb broadcasting the TODAY show live on the Allure of the Seas. In this segment, they take a look at what to wear on a cruise. Also, we'll look at great products to take on weekend getaways (which of course could be on a cruise ship). The hosts were onboard Allure of the Seas November 19, 2010. For the full story, see MSNBC's website.. The cruise portion started at 10 AM Eastern time. 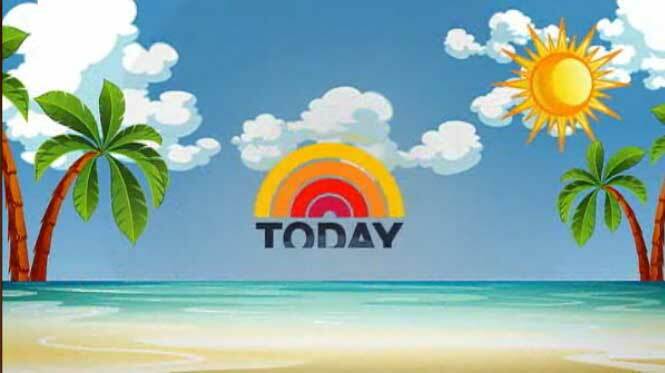 For products featured in the following video, check out Bobbie's buzz: Top tools for trips on MSNBC's TODAY Show website. 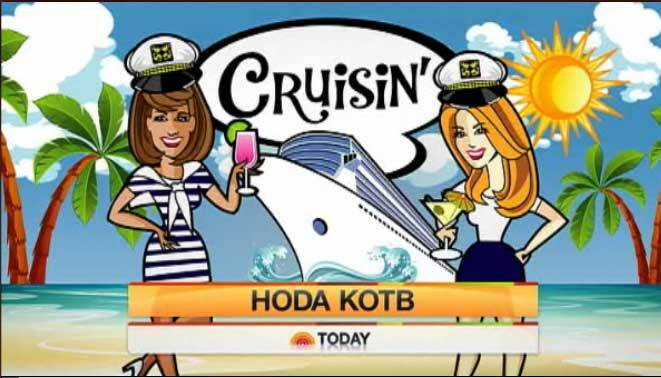 Tune in to NBC's TODAY on Friday, November 19th between 10:00 am and 11:00 am Eastern, when hosts Kathie Lee Gifford and Hoda Kotb will broadcast live onboard Allure of the Seas. The TV personalities will lift the curtain on the distinguished line-up of entertainment and innovative onboard amenities that differentiate Allure from Oasis of the Seas®. Don't miss it! Just as they did when Oasis of the Seas arrived in Flordia, the crew of the TODAY show will broadcast live from Allure of the Seas. This will be your first opportunity to see the Allure of the Seas as final preparations are made for the first revenue guests to arrive in December. We will update this post later today with highlights from their visit. Don't forget .... We will be on the Allure of the Seas for one of the pre-inaugural cruises and will bring you our pictures and videos from the latest entry in Royal Caribbean's fleet. Meanwhile, you can check out our other posts about Allure of the Seas by searching this blog for "Allure". As promised, here are three video clips from the TODAY Shows visit on the Allure of the Seas today. You'll get to watch them experiencing the ship, including a quick zip from one end of the Boardwalk to the other. From taking a ride on the zip line to getting a 14-karat-gold facial, Kathie Lee and Hoda check out all the activities aboard Royal Caribbean’s Allure of the Seas. Watch this video to check out the activities. 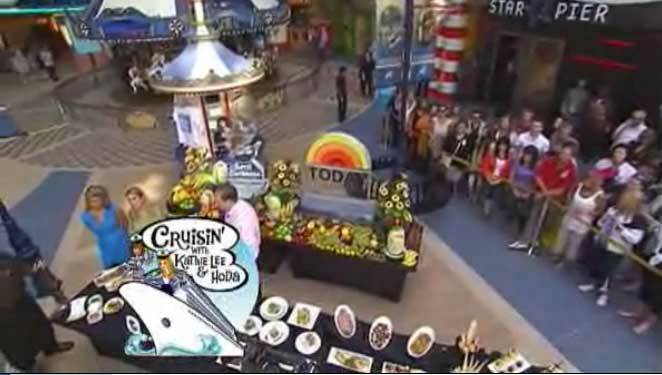 The TODAY hosts tour the Allure of the Seas cruise ship and imagine all their favorite actives aboard the ship. We hope you have enjoyed these clips from the TODAY show. Allure of the Seas is an amazing ship, just like her sister, the Oasis of the Seas. One of the myths about cruising is "there is nothing to do". We'd be amazed if you could still say that after watching these videos. See you soon from onboard the Allure of the Seas. How Do You Plant a Garden on a Cruise Ship? That may sound like a silly question, but for Royal Caribbean International, that was just one of the final preparation processes that had to be solved while the Allure of the Seas is in its homeport of Port Everglades. The answer of course, is by crane. Pictured here is the Oasis of the Seas finished version of Central Park. The Allure will once again benefit from the experience of its sister ship as Central Park is recreated one more time onboard a cruise ship. 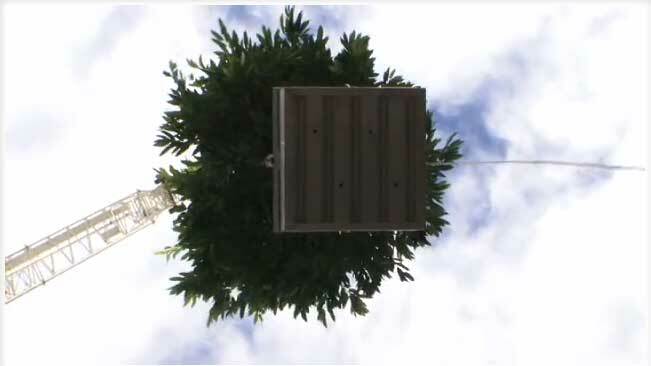 Just like one would plan their own garden in the back yard, Royal Caribbean's designers drew up plans for the finished garden, ordered the various trees, flowers, and shrubs, and waited for the assembly day to arrive. On the assembly day, the plants and trees were organized and "airlifted" by crane from the pier to the ship. Crews quickly unloaded the crates and the planting began. It didn't take long before Central Park took shape. In this video, you'll see first-hand hour Central Park was assembled by a talented team of gardeners. In the wake of Hurricane Tomas, this normally picturesque Caribbean paradise is without much of its infrastructure, prompting a recent Travel Alert by the U.S. State Department. St. Lucia's Prime Minister declared a state of emergency, and reports indicate that St. Lucia’s transportation and communication infrastructure was seriously affected. This Travel Alert expires on December 1, 2010. According to the travel alert, "There are no reports of U.S. citizens killed or seriously injured in the storm or its aftermath. However, major roads and bridges on the islands are closed due to landslides and flooding, making transportation around the island extremely difficult or impossible. Cell phone towers are down, resulting in limited communication, and some areas do not have electricity or water. St. Lucia authorities are working to restore services as soon as possible. Both airports on St. Lucia are open, but operating at limited capacity." St. Lucia wasn't the only country impacted by Tomas in the region. St. Vincent and the Grenadines also experienced significant damage due to Hurricane Tomas in the northern part of the country, but areas generally frequented by travelers were not severely impacted. Cruise lines are monitoring the situation and may substitute a different port of call for St. Lucia. The travel alert indicated "U.S. citizens should contact their tour operator, airline, or hotel for further information on the situation before traveling." U.S. citizens who choose to travel to St. Lucia despite the Travel Alert are urged to enroll with the State Department's travel registration website. Please continue to monitor the Embassy’s website for updated information at http://barbados.usembassy.gov/. We wish the people of St. Lucia well, and hope that they will be able to quickly restore the infrastructure so that their lives can return to normal and tourists can once again visit this beautiful country. Carnival Splendor was towed to San Diego following the fire which occurred off the Mexican coast on November 8. A team from the U.S. Coast Guard, NTSB and flag authorities, along with Carnival's engineers and technicians, is currently on board investigating the cause of the fire. Carnival personnel are being assisted by representatives of the shipyard that built the vessel and other manufacturers of engine room components in assessing damage and necessary repairs. "We realize how much guests look forward to their vacations and know that they are very disappointed by this news. We too are disheartened that we are not able to fulfill the dreams of those who have entrusted us with their important vacation plans. We sincerely apologize to everyone who was scheduled to sail on these cancelled voyages and look forward to welcoming them aboard in the future. Now that we have a full technical team engaged in the assessment, we wanted to provide this information as quickly as possible," said Gerry Cahill, Carnival president and CEO. Please continue to check back here for updates. If you are affected by this, please click here for an important notice detailing your options. In the wake of Sunday's brazen robbery at gunpoint of a bus full of Celebrity Mercury passengers on a St. Kitts shore excursion, at least two cruise lines have canceled calls on the island. Carnival Miracle, scheduled to visit St. Kitts headed to Antigua, and Princess Cruises' Grand Princess will make a similar detour on Wednesday. Two masked gunmen on St. Kitts held up 17 passengers from Celebrity Cruises' Celebrity Mercury who were on a ship-sponsored tour, called "Essential St. Kitts", that includes a sight-seeing drive of the city of Basseterre. The tour was headed to Brimstone Hill Fortress National Park, a popular tourist spot. According to police reports, the gunmen blocked the road with a fallen tree which prompted the bus driver to exit the vehicle to clear the road. When this was done, the band of robbers emerged from the bushes and robbed the tourists at gunpoint before disappearing back into the woodlands. The passengers' cash, jewelry, cameras and other valuables were taken and fortunately noone was injured in the incident. "We are thankful that none of our guests were injured in this unfortunate event, and will continue to provide them any support they may need. A vacation is supposed to be filled with fun, rejuvenation and relaxation. An act of crime should not be part of any vacation, and we regret our guests had to experience those events." 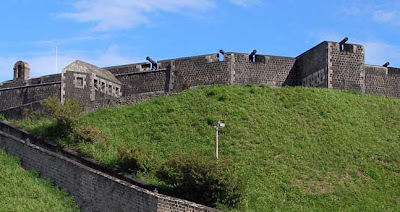 St. Kitts-Nevis Observer was told by a police spokesperson, "this tour bus robbery is an unprecedented incident in St. Kitts, where visitor safety is of the highest priority. Last year, over (500,000) cruise passengers safely disembarked in St. Kitts...we deeply regret any type of incident that might tarnish our visitors' experience." It is believed that the recent surge in violence in the Caribbean is linked to an increase in drug traffic. Much of the cocaine headed for the U.S. and European markets from South America transits the Caribbean. Watch here for updates from the cruise lines in reaction to this incident. It is common for two cruise ships to pass each other while at sea. On Saturday, November 13th, a historic first occurred. The two largest ships afloat met for the first time. The Allure of the Seas just arrived from Finland to its home port of Port Everglades, Fort Lauderdale, Florida this week. Allure's Captain Zini produced another video log capturing the moment. He is very grateful for all the information that was shared with him from Oasis of the Seas first year in operation. Words can't express the scene, so I encourage you to view the video yourself.